The African elephant is the largest animal on earth; their herds wander through 37 countries in Africa. On September 19, the Zoo celebrates these magnificent animals through special activities for Elephant Appreciation Day. The event is designed to spread awareness and highlight the conservation efforts for these majestic, endangered animals. Activities run from 10:30 a.m. to 2:30 p.m. Elephant Barn: Enter the world of the Zoo’s two African elephants, Ruth and Brittany, and see what an average day is like for them while touring the elephant barn between 11 a.m. and 1 p.m.
“Go Grey:” Wear a grey piece of clothing, in support of elephants, and you’ll be entered into a special drawing! “Go Grey” is in conjunction with the Wildlife Conservation Society’s program to draw attention to the perilous plight elephants face in the wild. Enrichment Activities: Our Zoo elephants take part in enrichment activities, encouraging them to use some of the same behaviors as they would in the wild. Join us for a welcoming talk at 10:30 a.m. and watch the elephants interact with different items to keep their minds active. A second enrichment session takes place at 2 p.m. Paintings by our elephants will be available for purchase during this special event. All proceeds benefit elephant conservation. Elephant Art and Artifacts: Touch elephant-related artifacts like a real tusk and tail hair. Some of the enrichment opportunities offered to Ruth and Brittany involve creating paintings with a brush held with their trunks. Today, visitors will have the chance to purchase these unique works of art. All proceeds benefit elephant conservation. Wild Elephants: Try something new, and write your name and message for wild elephants on a specially designed paper elephant foot, and post to the barn for display. Big Behaviors: Hear and see how the elephants are trained as they display different behaviors through a special training session with zookeepers at 1:30 p.m.
NEW THIS YEAR! Visitors can sign letters supporting the strongest possible federal ban on ivory. 96 elephants are killed every day in Africa. These amazing animals need our help and protection to end the illegal ivory trade. While you’re here, take an “Elphie,” and post to social media in support of the federal ivory ban using #elphie and #join the herd. Show Your Support: Wear your elephant ears from the day’s activities, and receive a free ride on the Penzeys Spices Carousel. Save the Species: Learn more about elephants in the wild and their habitats and how our Zoo contributes to elephant conservation projects throughout the world. 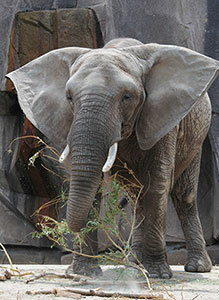 Proceeds from Elephant Appreciation Day will benefit the International Elephant Foundation and Elephants for Africa. All activities for this special event are included in regular Zoo admission. For further details; please contact the Zoo’s Public Affairs and Services Division at 414.771.3040.